Wow, time really flies. Christmas is right around the corner and there is still so much to do. I have a busy few days ahead of me, gotta love the joys of Christmas. All the busyness and running is well worth seeing the excitement on my sweet Christina’s face. Today I have two cards to share with you. I really prefer to do one post per card but I’d really like to share all my Christmas cards with y’all before the new year so I’m doubling up today’s post. Both cards I’m sharing today were created using SVG files and metal dies from My Treasured Kutz. I love how this first card came out. The card base and oval frame were cut on my Cricut Explore using Recollections cardstock. To do the oval frame I used the Design Space shape tool, putting an oval on top of the rectangle and attaching the the shapes to each other. The Christmas trees are from the My Treasured Kutz (MTK) Decorating The Tree SVG file, which I cut on my Cricut Explore as well. The reindeer and snowflake where cut using MTK metal dies and my Sizzix BIGkick. I then inked the edges and added some detail to my reindeer, snowflake and trees using American Crafts Pigment Ink and a disposable lip applicator. I then attached my trees. The center tree was attached flat to the card using an Elmer’s Tape Runner and the two trees on the sides were attached using foam mounting tape. I then glued down seed beads using Scotch Quick-Dry Adhesive, only applying enough to be seen through the oval cutout. After I was done gluing the beads on I attached the oval frame using foam mounting tape (I layered my mounting tape to make it thicker). To attach the reindeer and snowflake I used my Xyron Sticker Maker. 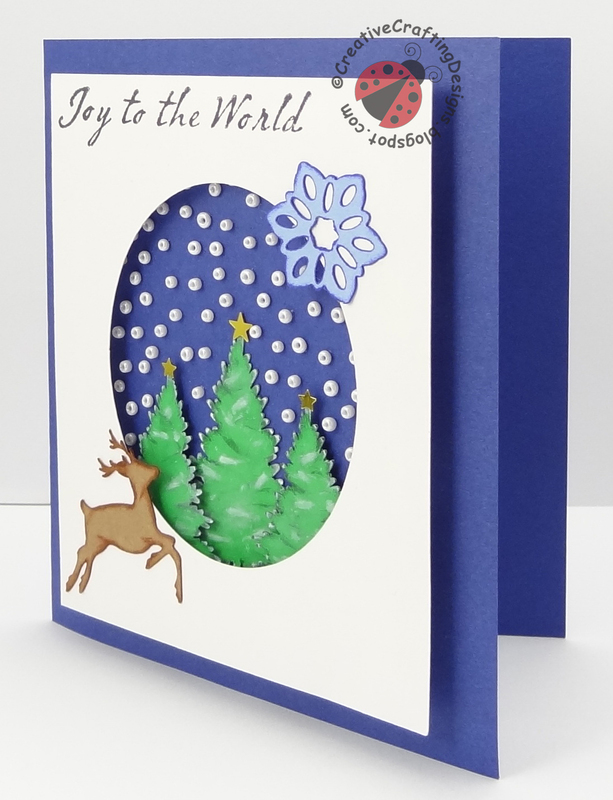 I finished up this card by adding some star sequins to the top of the trees and the sentiment “Joy to the World” (the sentiment was done using a miscellaneous stamp and Tuxedo Black Memento Ink. So, Now it’s time to get on to my second card. This card is actually a very easy card to make. It’s great for if you are strapped for time and want to create something that looks like you put a lot of effort into it. To create this simple beauty I started by cutting the base of the card out with my Cricut Explore. 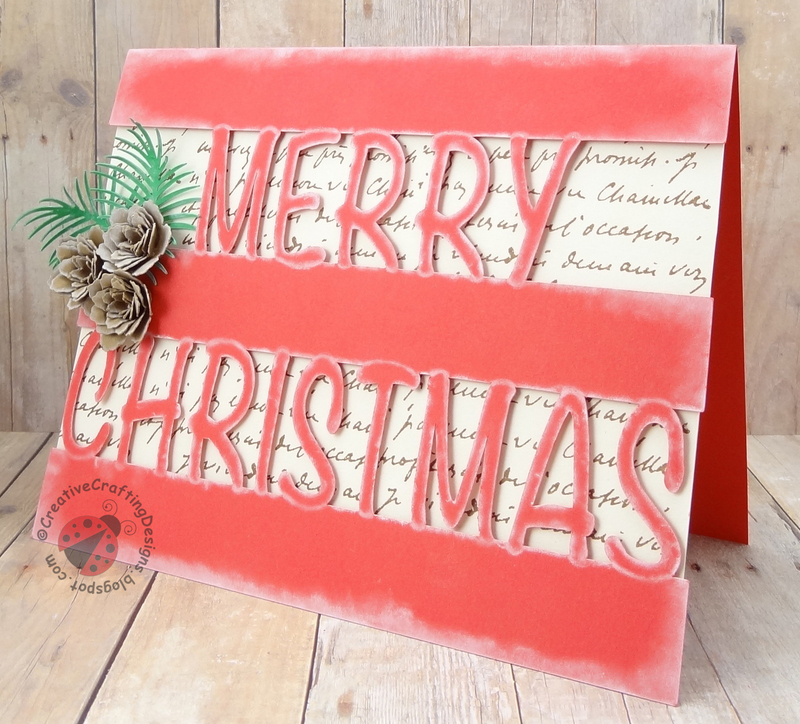 The card base is a SVG file by My Treasured Kutz called Merry Christmas Card #6. 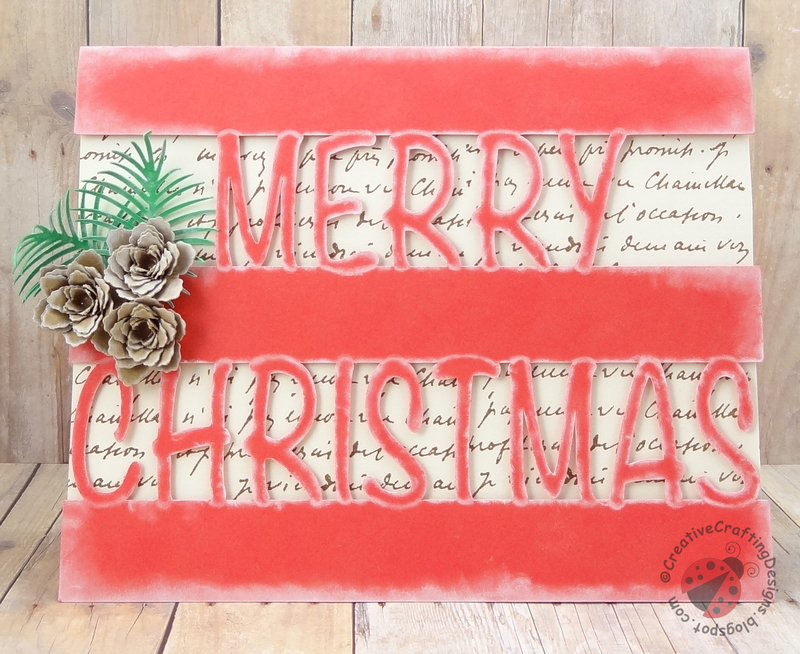 After my card was cut out I used white American Crafts Pigment Ink and a disposable lip applicator to trim the edges of the card and all letters. I love how doing this it created the look of snow. I then attached some script cardstock behind the lettering, I used foam mounting tape for that so the letters were raised up. For the flowers I used the Baby Pinecone metal die by My Treasured Kutz and my Sizzix BIGkick. And yes, I said pinecone, I used a pinecone die to make flowers, lol. Flowers were not my intention, I was trying to make the pinecones but they came out looking more like flowers, so I just ran with it (I think I did something wrong). If you look at the pictures on the MTK website, you actually can make 3d pinecones with the die, which is very cool. My mistake actually goes to show the versatility of the die 😉 Ok, So… after I had my flowerpinecones cut, (lol, I’m making up words now, heehee) I inked them with the same ink I used on card and then shaped them using a foam mat and a stylus tool. I then quilled the flowers using a quilling tool and Scotch Quick-Dry Adhesive. I attached my flowerpinecones (there I go again with my made up word, lol) to my card and finished up by adding some Pine Bough leaves behind the flowers which is also a MTK metal die.